We spend a lot of our time in Xcode. It's a huge app with tons of different panels and views to explore. Today we'll look at some of the most helpful keyboard shortcuts in Xcode and how they can help us navigate around Xcode's interface more quickly and efficiently. Let's dive in. Xcode's keyboard shortcuts can be tricky to learn (there's quite a few), but they are actually very intuitive (and usually guessable). We can open any of the panes in the navigator area with ⌘1-7. We can toggle the whole navigator open and closed by pressing ⌘0. We can do the same with the utility area (right side) using ⌘⌥1-7 and ⌘⌥0. We can focus in the filter bar of the current pane with ⌘⌥J. We can toggle the debug area with ⌘⇧Y, toggle breaking at breakpoints with ⌘Y. We can also pause/continue execute with ⌃⌘Y. ⌘-click symbols to navigate to them. 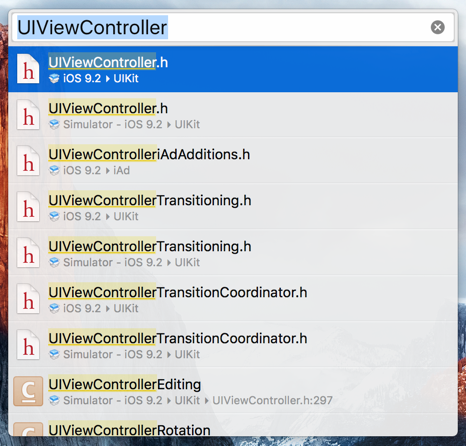 One of Xcode's most powerful keyboard shortcuts is ⌘⇧O. This displays a Quick Open panel that certainly lives up to its name. Navigate with the arrow keys, then press ↩︎ to open a file. Hold down ⌥ when opening a file from this panel to open it side-by-side in the assistant editor. Then toggle the assistant with ⌘↩︎ and ⌘⌥↩︎.